Welcome to another #TenThings feature. 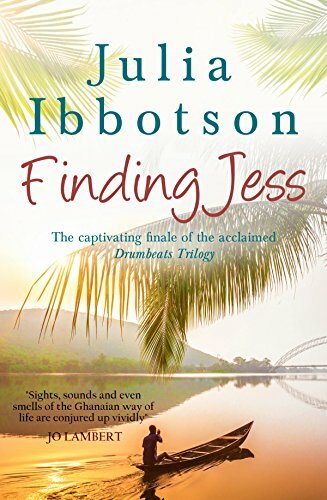 Today we are going to be finding out #TenThings about Julia Ibbotson, author of Finding Jess. I’ve published 6 books so far, in about 7 years, but I wasn’t sure which genre I wanted to write in so I’ve written memoir/history of food/recipe book (The Old Rectory: escape to a Country Kitchen) http://myBook.to/TheOldRectory, a children’s medieval fantasy (C.A.R.S) http://myBook.to/SCARSchildrensbook , a women’s fiction trilogy (Drumbeats, Walking in the Rain, Finding Jess) and an early medieval time-slip mystery (A Shape on the Air) http://myBook.to/ASOTA . I’m most proud of the lovely reader reviews I’ve had for all my books, especially the last one for A Shape on the Air which said it was “in the best Barbara Erskine tradition” – and I love Barbara Erskine’s historical time-slips! I’ve now decided I like writing medieval time-slip or multi-period mystery best, so this is my new direction – I’ve found my genre at last! But I need to add that I loved writing every one of my books, and there was an inspirational story behind each one. Although I’ve always written, and wrote my first full length novel at age 10, I only began writing for publication (my publisher is Endeavour) about 7 years ago. The career which paid the mortgage (I was a single parent for 10 years) has been as a school teacher (Head of English and Drama) and a university lecturer/researcher. Now that I write fulltime, I swim 25 lengths of the pool most mornings before I get down to writing, and have about 30 minutes in the gym. I love walking in the beautiful countryside around my home. I’m an outdoor person so at the first glimpse of sunshine I’m in the garden or on a walk round the village. The book I’m currently promoting is Finding Jess, the last of the Drumbeats The story completes Jess’s journey, and was published this summer. It sees single mother, Jess, struggling to get her life back on track after the betrayal of her beloved husband and of her best friend. On the brink of losing everything, including her family, and still haunted by her past and the Ghanaian drumbeats that pervade her life, she feels that she can no longer trust anyone. Then she is mysteriously sent a newspaper clipping of a temporary job back in Ghana. Could this be her lifeline? Can Jess turn back time and find herself again? And what, exactly, will she find? Finding Jess is a passionate study of love and betrayal – and of one woman’s bid to reclaim her self-belief and trust after suffering great misfortune. It is a feel-good story of a woman’s strength and spirit rising above adversity http://mybook.to/FindingJess . 9. My work-in-progress is a medieval multi-period mystery, working title Azulejo, set in Madeira where we have an apartment, and reflects the early history of the island. It moves between the present day, the 14th century and the 16th Again, like Drumbeats, it’s a story I’ve wanted to write for years. 10. Not many people know that I have a PhD in linguistics, I studied medieval history, language and literature for my first degree and learned to speak in Anglo-Saxon, I’ve trained as a yoga teacher and I’ve sung in several choirs, including a church choir (currently) and a rock choir. Single mum Jess has had her world turned upside down. Now it’s about to be turned inside out. Jess has got a tough life back on track after love-of-her-life husband Simon walked out on her and their beautiful young daughters Katy and Abi. But she has long-time friend and confidante Polly to turn to…until Polly and Simon start having an affair together. When Polly decides to apply for a job at Jess’s school, in the English department, Jess feels threatened. So why has Polly set her sights on the department head’s role? And why is the school now offering Jess a sideways ‘promotion’? Jess can no longer trust anyone – including herself. Then out of the blue she is mysteriously sent a clipping for a temporary post in the Ministry of Education in Ghana, where she did a gap year as a teenager, and where she was happy. She is on the brink of losing everything at home but could this be a lifeline? Julia Ibbotson’s Finding Jess is a passionate study of love and betrayal – and of one woman’s bid to reclaim her self-belief and trust after suffering great misfortune. It is a feel-good story of a woman’s strength and spirit rising above adversity. Thank you so much for featuring Ten Things About Me today and for taking part in the book blog tour with my latest, Finding Jess, the 3rd in the Drumbeats trilogy. Much appreciated!